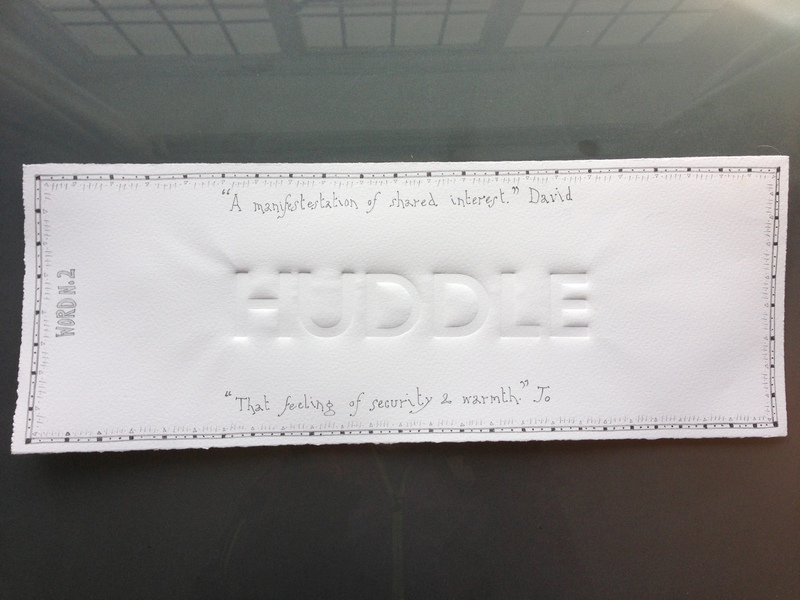 David: The word for today is HUDDLE. Earlier, when the sky was dead skin grey, rain coming in bursts of tantrum, all the boats outside my window seemed to be huddling together for warmth, for protection against the weather as the bunting shivered and flapped. Yet now, the sky is gin bottle blue and yet they are still in a huddle. It has made a transition from a huddle out of fear and desperation, into one of community. People wanting to be close to each other. A choice of tight space to make stepping between boats easy. Conversation and laughter travelling in tight lines and circles in the huddle. A wonderful sense of choosing to be in the same space of others. The huddle as a manifestation of shared interest and a like for company. Jo: Immediately I saw this word the years rolled away. When my lads were young and we were out for a walk, they would start asking for a cuddle – to be carried. As they were getting rather too heavy for this, we invented the concept of a hand cuddle. This was soon abbreviated to huddle. So, just as the people around you wanted to be close physically and communicate, it was the same with my young lads. That feeling of security and warmth. Interestingly they have both grown up to be very physical in their affection, with big hugs being given all round upon arrival and departure. Huddling still being very much part of their lives.